While you can certainly change things up based on what you have, the following are the basic key elements: Buddha statues, amulets and images, a bowl of water that's been scented with perfume and flower petals added, and also something to be used to sprinkle that water with (which can be long stemmed flowers or a cup) and a couple of short candles. Ideally, if you can get holy water from the temple that'd be even better. You may be thinking what the purpose of this is? There are several reasons. For one thing, it's an opportunity to bring out one's Buddhist objects out for a yearly cleaning. 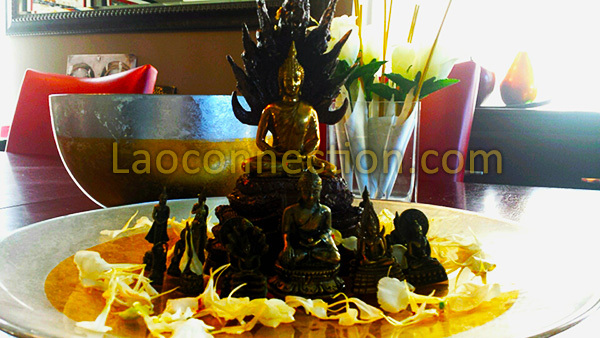 Additionally, you'll need them for creating a prayer altar during Lao New Year. The water is then sprinkled onto these Buddhist objects, on to family members and friends, all over the house and even one's vehicle - all as to bestow blessings. It may seem like non-stop blessings during Lao New Year and that's because it is! And it starts in the home with this pop-up altar!